The District’s annual golf outing is just one month away. Register on line via the District’s web site. or send your regrets that you cannot attend by clicking here. Download the Registration form from the web site at www.rotary7620.org. Scroll down in the middle of the site. Or a .jpg is attached and mail the completed form to Rich Glover along with your check. Call Rich Glover, give him the names of your players and a credit card number. Most importantly, WE HAVE EXTENDED THE REGISTRATION TO MARCH 15TH. All players must be registered and prepaid. 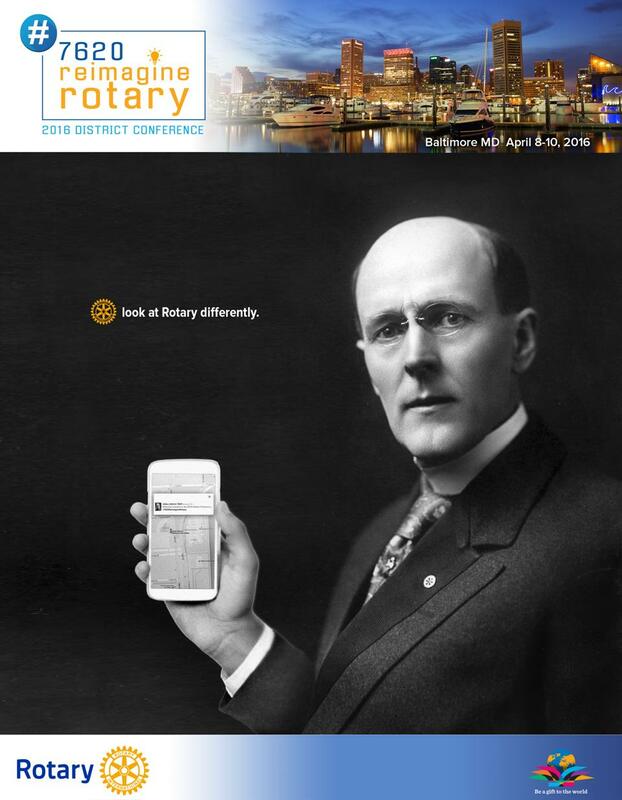 Thank you to Rotarian Darren Easton, Vice President and Creative Director of the Cyphers Agency, Annapolis, Md., for creating this amazing image. How cool is this? Instead, register for the District Conference because Rotary District Conferences offer an extraordinary value proposition for those that choose to attend. For most members, the Conference is a wonderful opportunity to see Rotary through a different perspective than the one they have from attending their club each week. Interacting with Rotarians from around the Rotary District is generally educational, interesting, and fun. That’s because, as surprising as it may seem, Rotarians themselves are generally (Four Way Test Alert…..I did say generally) interesting and fun….and sometimes educational. Attending a District Conference is one of the best ways I know to learn from other Rotary clubs about the “best practices” that work for them. Many Rotarians who attend the District Conference lean about best practices and other Rotary information from informed speakers and interesting breakout sessions. Many other Rotarians find that the best time to steal….er…..borrow…..er…..discover best practices is in the club-sponsored hospitality suites. Here Rotary Clubs from around the District are busy offering free specialty drinks and desserts to Rotarians deeply interested in world peace. After a couple of pops in the hospitality suites the true meaning of Rotary and frankly, life itself, is generally discovered by all concerned. What fun!